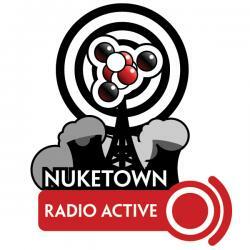 Nuketown Radio Active returns after a month-long, baby-induced hiatus with news that NeutronLad has arrived! Things then take a technological turn with a discussion of various tools and Web sites to enhance your geeky productivity. The podcast is rounded out by a review of the first of the books on my my Summer Reading List: Transmetropolitan: Back on the Street, a graphic novel written by Warren Ellis and illustrated by Darick Robertson. NetronLad is here! He was born June 14 at 6:13 p.m., weighing 8 lbs, 3 oz. and measuring 22 inches long. He’s got blue eyes and his mom’s red hair, and is just one heck of a beautiful kid. Nuketown Beta work proceeding: It’s moving forward at a frantic pace, with major new chunks falling into place each day. Spotlight and a fast app launched rolled into one. Searches everything on your machine (bookmarks, files, apps, etc.) and then lets you do stuff with it. E.g. I can search for “Rush”, which pulls up a list of my Rush playlists in iTunes, which I can then choose and play. I can’t live without it. Or rather, don’t want to live without it. Get a plan, get some software, and get organized. Good organizational site in general, and great for Mac users in particular. This is the site where I discovered Quicksilver. Get productive (or just get geeky) by visiting this blog about how to improve your life and get more productive. If ever wondered if you could control your home computer through e-mail, this site’s for you. This month is Random Signal’s 1-year anniversary. Know I plug the show a lot, but it is cool and 1 year is a totally Airwolf milestone, so congratulations to Jason on reaching it! Follows the half-crazed, gonzo-style reporting of Spider Jerusalem, journalist turned author turned mountain man turned reporter as he returns to the City in order to write the two books he promised his publisher. In doing so, he gets caught up in a rebellion by the Transients, humans in the process of transforming themselves into Grey aliens. Fast, furious, brutal read, with visuals to match – not for the weak of heart, but the reporter in my loves the idea of being able to break in a building, throw down some gunfire against the yesmen, and demand an interview. Next Post:Welcome to the New Nuketown!